Business is a funny thing. Some things can be easy, and some things hard, and it’s difficult to predict in advance which will be which. The most annoying issues are ones that really aren’t that big, ones that should be easily solved, but for whatever reason we just can’t do so. One of these issues has been cones. My brother and I have always been a fan of waffle cones, and when we set up the business, we had never thought we would serve anything else. However, finding cones we liked (and were reasonably priced) was quite another matter. We did find some decent ones early on, but so many of them kept arriving broken, that we gave up. We’ve been looking and looking, for almost nine years. 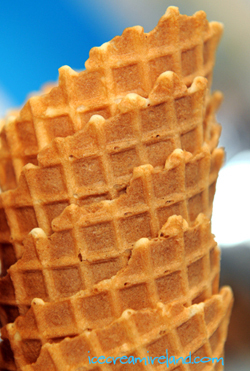 Time went by, and we served our ice cream on wafer cones instead, even though we never were that excited by them. We explored the possibility of making cones, and we ordered up samples when ever we heard of a source somewhere in Europe. Anyway, problem solved! My brother managed to find a company making great waffle cones, and we’ve just received a few pallets of them. They are extremely tasty, and they are in one piece. It looks like the end of the wafer cone is nigh at Murphys. Finally. Just in case you’re wondering, the bottle JP is holding is not our strategy for keeping up our spirits during the recession. 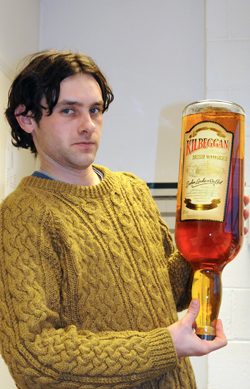 It’s Kilbeggan whiskey from Cooley, Ireland’s only independent whiskey distillery. We love it in the ice creams (it’s a great, malty, robust drinking whiskey as well), and we’re going to switch over to using it exclusively (we have been using Paddy or Jameson, however not only do we prefer the Kilbeggan, but it’s great to support an independent Irish company). This has been a hard week, and it’s only Wednesday. 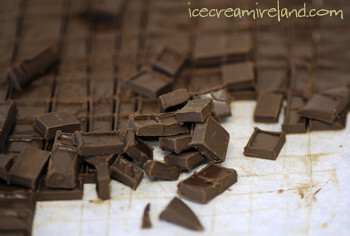 First a freezer failed, and we lost a lot of ice cream, and then we had news that Fresh Supermarkets in Dublin are thinking about dropping us. If you buy your Murphys Ice Cream at Fresh, please make your displeasure known to the manager! 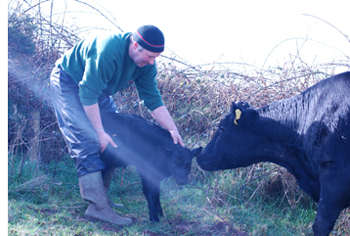 However, there is something that cheers me up each spring, and that is when I hear from Colm, the farmer who supplies us with Kerry Cow milk, telling me that the first of his Kerry cows has given birth. 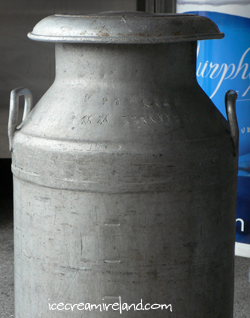 It means that we’ll soon again have a regular supply of rare and delicious milk for the summer season. The soaring price of food was often in the news in 2007, and we are not immune. We have been looking at our accounts, and it is impossible to miss the fact that many of our main ingredients, including milk, cream, and eggs, have risen as much as 30% within the last calender year. While this is good news for farmers, who have seen generally declining prices up until recently, it is not good news for consumers. ItÂ is inevitable that we (like many other food companies) will be forced into a price increase to counter our rapidly shrinking margins. What’s interesting is that the price disparity between organics and conventional foods, although still substantial, has shrunken somewhat. With a litre of local, regular milk now an amazing 1.24 in our local supermarket, we have discussed whether we should switch to organic milk for our coffee drinks. Organic milk costs more, of course, and we would have to pass that on. Would such a move be a good idea? We all know that organics is a good thing, but how much extra would you be willing to pay for a cappuccino or latte made with organic milk? When West Kerry farmer Colm Murphy first brought some Kerry cow milk to Murphys Ice Cream for us to sample, we were delighted. 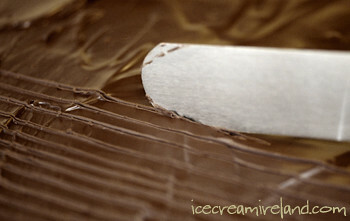 The test batch of ice cream came out smoother, creamier, and just plain delicious. The milk impressed our entire team, and our customers also responded to the improved taste, although most expressed bafflement when we mentioned the Kerry cow. “You mean a cow from Kerry?” It seems our indigenous breed has largely faded from our consciousness. Once, however, the Kerry was indispensable. It is one of the oldest breeds in Europe (probably brought to Ireland from the Mediterranean by Neolithic wanderers) and the first developed for milking. Our ancestors churned Kerry cow butter, concocted Kerry cow cheeses, and stored milk treated with herbs in jars underground while other prehistoric people hunted and gathered with stone tools. 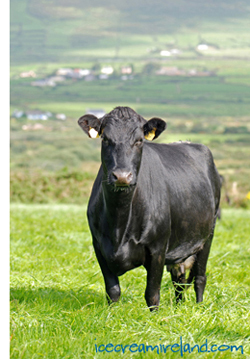 So valuable was the Kerry that under Brehon Law the top unit of currency was the milking cow. There’s a traditional song, “I wish I had a Kerry cow, a Kerry cow, a Kerry cow…” No wonder it’s repeated. Your cows defined your wealth, and if you owned a few of them, you were doing ok.
By the late 1970s, however, the value of a milking cow diminished to the volume it produced, and Friesans dominated the Irish herd. The little Kerry, famous for quality, not quantity, faced extinction. At the lowest point, only 100 Kerry cows survived worldwide, and half of them lived on Raymonde Hilliard’s farm in Killarney. When I took a break from our Killarney shop to visit her, Ms. Hilliard told me about farmer after farmer retiring or giving up their herds until saving the Kerry cow seemed a hopeless cause. Luckily, herself and a few other champions of the breed persevered, and the government finally introduced a protection scheme in the early 1980s. Since then, the population of the Kerry has slowly increased to its present total of 1,100. That may sound quite healthy, but to put it in perspective, there are 1,600 giant pandas in the wild, and they are considered extremely endangered. Although there is still a decline of Irish dairy farmers, Colm Murphy is not about to give up. 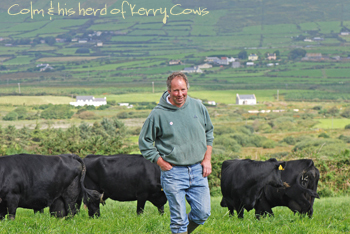 He loves his herd, and the Kerry cows impress him. “I’ve never had to lift the hoof of a Kerry,” he says, “and I have never had a problem with calving.” At Murphys Ice Cream, we don’t know about such things, but we do know we have never tasted better milk. 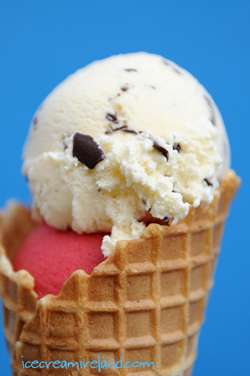 This week’s recipe is “crema,” Italy’s most popular ice cream. 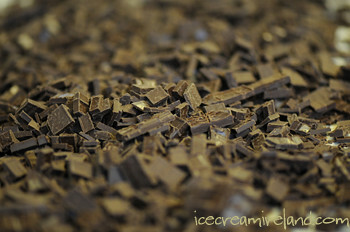 Crema is an unflavoured frozen custard, perfect for savouring the flavour of Kerry cow milk – if you’re lucky enough to have some. 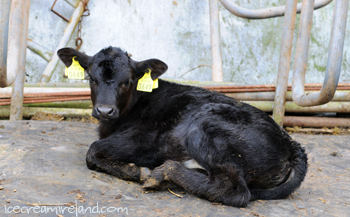 For more, visit the Kerry Cattle Society. One of my favourite times of year in Kerry is the Spring, when all the calves and lambs appear and start hopping around the fields. There’s something inspiring about the emergence of new life after a bleak Irish winter. 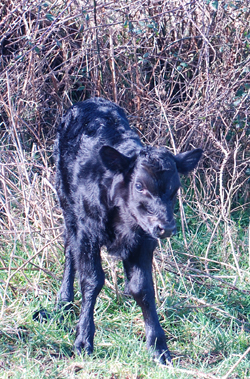 This morning, I had a text from Colm, the farmer who supplies us with Kerry Cow milk, saying that the first of his Kerry cows had just given birth, and I decided to go out and meet the little fellow and his mom, who will soon be improving our ice cream with her milk. (It’s amazing what a difference it makes). Given that the Kerry Cow breed is under threat (only 277 were born in 2006), seeing a healthy new calf certainly brings me a lot of joy. It’s a shame he wasn’t born a she, but that’s the way of things. I think Colm can’t quite understand my excitement about being on the farm and seeing the animals.